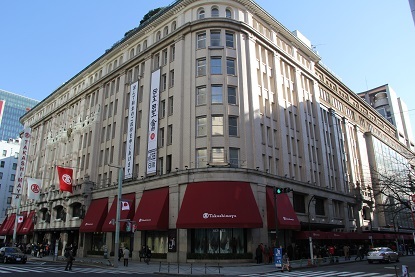 Takashimaya began as a clothing store in Osaka in 1831 and gradually expanded into one of Japan’s premier department store chains. Along the way it came to provide goods to the imperial household and still does to this way. Although you will not find the emperor and his his family shopping inside, Takashimaya does evoke a regality that easily rivals Mitsukoshi. Here too are all the swank and grace of elegance shopping. The floor plan follows the typical department store order, but there is an additional level of restaurants below the food section in the basement. Takashimaya’s food section may not may not differ much from other stores, but the vendors here are perhaps extra generous about handing out samples.